PROVERBS 21:23 KJV "Whoso keepeth his mouth and his tongue keepeth his soul from troubles." 20There is treasure to be desired and oil in the dwelling of the wise; but a foolish man spendeth it up. 21He that followeth after righteousness and mercy findeth life, righteousness, and honour. 22A wise man scaleth the city of the mighty, and casteth down the strength of the confidence thereof. 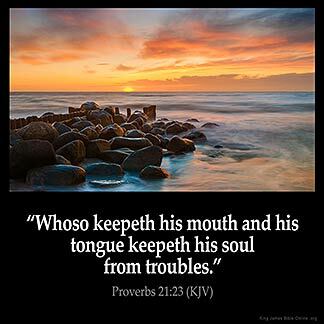 23Whoso keepeth his mouth and his tongue keepeth his soul from troubles. 24Proud and haughty scorner is his name, who dealeth in proud wrath. 25The desire of the slothful killeth him; for his hands refuse to labour. 26He coveteth greedily all the day long: but the righteous giveth and spareth not. Whoso keepeth his mouth and his tongue, keepeth his soule from troubles. Whoever keepeth his mouth and his tongue keepeth his soul from troubles. I am learning the vocabulary of silence as I go and at the same time learning to say what God says . have success in my life and not destruction.I will bridle my tongue at all times. I say that by faith because I am on the road to success .I will get to the point that my mouth will always say Blessing at all times : even over others when they are mean and ugly. God WILL fight for you, if you hold your peace.